(ﾖ b - 1)2 > (1-c). In Figure 1, we have drawn the two curves, b = (1-ﾖ (1-c))2 and b = (1+ﾖ (1-c))2 which meet at point II. Note that when c = 1, then b = 1, thus the maximum c is 1 and that maximum will be at b = 1. Note also that as regular monotonic dynamics require that b be greater than both curves so, above the curves (areas I, II and III), we obtain regular, monotonic dynamics. 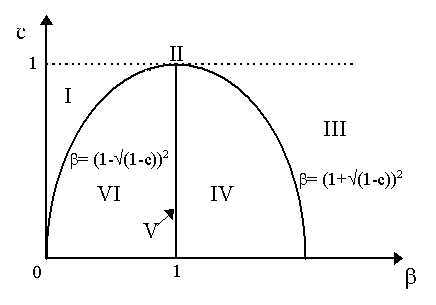 then we have instability (area III) whereas if b = 1 we have constancy (point II). as ﾖ (a2 + b2) = ﾖ 1 = 1 = a2 + b2, then we get unstable oscillations if b > 1 (area IV) and stable oscillations if b < 1 (area VI). Figure 1 summarizes the Hicks (1950) parameter regimes. Again like the Samuelson case, it is only when parameter values (b , c) fall in region V that we obtain regular cycles. Note, however, that to obtain V, all we have to do is obtain the value b = 1 for any c will be compatible with that. In Samuelson's multiplier-accelerator model, we were forced to obtain precise values of both c and b to get case V of constant oscillations. It seems that Hicks' multiplier-accelerator model remains equally insufficient as a theory of the cycle. 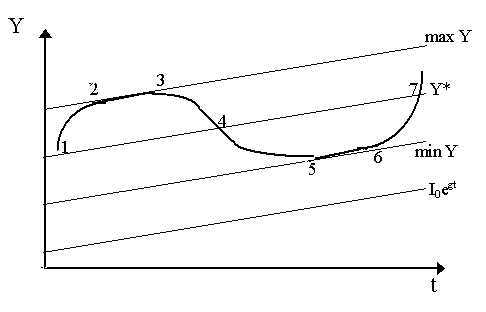 Constant cycles can be obtained, but they will not be structurally stable (as any slight movement of b above or below 1 will lead to explosion or stability). However, Hicks (1950) proposed that we add several things to our this basic MA model: namely, ceilings, floors and a exogenous constant growth rate of autonomous investment. This enables us to obtain growth with cycles. The logic is simple. Investment, as we know, is composed of two parts: autonomous investment, I0 and induced investment (induced by the accelerator, b (Yt-1 - Yt-2)). Now, Hicks proposed that for a growing economy, "autonomous investment itself will have to increase at a constant rate of growth" (Hicks, 1950: 59). Let us propose this constant growth rate to be g so that autonomous investment at any time period t is I0egt. Also, investment adds to the stock of capital, thus the greater investment is, the greater the stock of capital becomes. However, capital depreciates. Thus, some amount of investment will not result in a net increase in capital stock but rather only serve to replace existing, depreciating capital stock. min Y = [c0 + (I0egt - d )]/(1-c). Hicks then also proposes a ceiling. Output cannot grow indefinitely due to restrictions in factor supplies. Greater output may be demanded, but if one is at full employment, the only possible result is that the prices of these factors will rise - more supply will not be forthcoming. Assuming factor supplies also grow at the exogenous rate g, then the maximum output level also grows at rate g. This ceiling is shown in Figure 2 as the line max Y.
thus equilibrium output also grows at rate g (as shown in the Figure 2). Now, suppose we begin at point 1 in Figure 2. Obviously, we are in an upswing therefore output is growing so that the accelerator will be working and thus induced investment exists. Thus, the function which applies is I0egt + b (Yt-1 - Yt-2). Obviously, then, investment is growing at a rate greater than g. Thus, from point 1, output grows faster than g.
However, soon we hit the ceiling (point 2). As factor supplies cannot grow faster than g, then output is forced to grow only at rate g. Thus, as time progreses, we move from 2 to 3, i.e. output moves along the ceiling at rate g. Now, as output is still growing (at rate g, though), then the accelerator will still be working. However, net investment will be less than that which took us to the ceiling. Thus, as investment becomes less, then the maximal level of output is not sustainable by that level of investment (via the multiplier). Thus, output will have to move back towards the equilibrium. Thus, from point 3 we move towards point 4. But between 3 and 4, output is falling thus, b (Yt-1 - Yt-2) becomes negative. This will result in negative induced investment. Thus, again by the multiplier, output growth falls and falls at a fast rate. Eventually, of course, induced investment falls below depreciation, i.e. b (Yt-1 - Yt-2) < d , in which case, as per our investment function, the multiplier is eliminated and the only level of net investment will be I0egt - d . Thus, the multiplier is knocked out during the downswing. However, this level of investment cannot sustain high level of output, so output will continue to fall. When the falling Y hits the equilibrium Y*, the fall will not stop - as that equilibrium requires a positive level of induced investment. During the downswing, that value will be zero or negative. Thus, it moves beyond point 4 and towards point 5. At point 5, however, output hits the floor min Y. This, of course, is entirely sustainable by I0egt - d which thus implies that output will stop falling. However, given that autonomous investment is rising at its constant rate, then the multiplier will be brought back into positive effect so that Y grows now along the floor at rate g (e.g. from 5 to 6). But as output grows along the floor, then b (Yt-1 - Yt-2) becomes positive and some induced investment will begin to arise. Eventually, around point 6, I0egt + b (Yt-1 - Yt-2) will become greater than I0egt - d so that the first part of the investment function kicks in. Thus, output will soon begin growing faster than the rate g and we move away from the floor and back up away from point 6. Eventually, of course, we reach the equilibrium level of output, Y*, again - this time at point 7. However, the propulsion provided by the accelarator from the previous rapid growth from 6 to 7 will carry Y above Y* and back towards the ceiling. We have outlined the simplest growth cycle model of Hicks (1950). There is growth at all times due to the exogenous growth of autonomous investment. But the rate g is necessary not only for cycles with growth but also for the existence of cycles themselves. If we eliminated g, then Y* and min Y would be flat and the cycle would end. Simply, as Y would hit min Y, then it would not rise again as induced investment would not kick back in. Thus, only three-quarters of the cycle could be explained.